Pair of Quails [2Quail_Plate_Flowers] - AUD $329.00 : Kif and Katast, a new contemporary design space featuring our in-house range alongside the works of local & international, established and emerging artists. 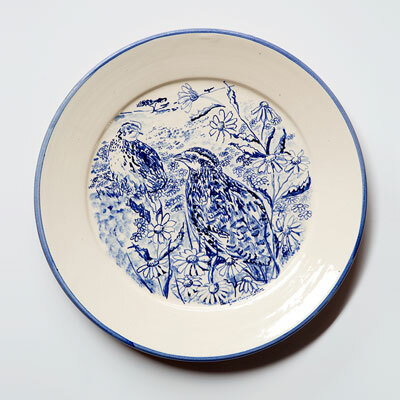 This gorgeous ceramic plate featuring a pair of blue hand painted Quails is produced by two fabulous Portuguese artists. Beautifully made, the plate is a great conversation piece, which could be displayed on a wall or sideboard. I discovered this ceramics on a trip through Portugal some 10 years ago. On a recent trip to the UK, I decided to do a side trip to Portugal specifically to try and track down the artists behind these gorgeous pieces, as unfortunately I had no contact details for them. Armed with only a vague idea of which town and subsequent bus route my sister and I had been on when we stumbled across the ceramics all those years ago we struck out. After a long day hunting, I was about to admitted defeat when I spied in a window one of their plates! As luck would have it we had come across the artist studio, and had a great chat. As this story attest, we go to great lengths to source our products, and we love the pieces we stock!